Myth 1: The big computer assessment every three to five weeks is formative assessment. By three to five weeks, the students have learned and practiced the wrong way of thinking so that learning has become cement. When he assess on a daily or weekly basis, we catch learning gaps in the process and correct them. Myth 2: The teacher uses technology to collect student work. Yes, the teachers can use many web 2.0 tools such as wiki, voki, Google Forms, Glogster etc but the teacher has to move from collecting the evidence to recording the student data. If a teacher does not collect and make decisions based on the recorded data, then the teacher does not do formative assessment. Without recorded data, the teacher cannot measure progress over time. Myth 3: The teacher can use technology such as voki, audacity, Word to talk to the students after seeing the students’ work. The teacher needs to do more than talk, he/she needs to give the student a new strategy to improve. If the student is stuck, he /she needs a precise way to get unstuck. Myth 4: More practice on Quia, Google Forms, Blackboard, etc. will improve the students’ learning. Only when the students learn why they got the answer wrong and learn how to think differently will they get the right answer (way of thinking). A “you are right/you are wrong” quiz program does not help students to grow. Myth 5: Once the teachers see the students’ work through technology, the learning is done. Formative assessment requires re-assessing and giving different strategies until the student shows improvement to the desired level. Often the students’ technology project is a draft and not the final version of his/her learning. The student takes many assessments until he/she shows the desired mastery. Want a quick way to get your students conversing more in the target language? Want an easy way to help your students improve in their speaking on a daily basis? This practical book shows you how to use formative assessments to gain immediate and lasting improvement in your students’ fluency. 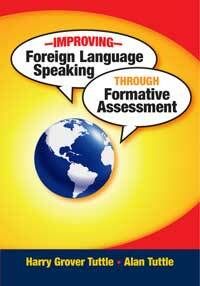 Provide struggling students with over ten improvement strategies for each language function. Engage students in over 170 speaking activities. Each speaking assessment include instructions, the assessment form, extension activities, speaking topics, and at least ten strategies for improvement. There are ready-to-use checklists including the “I Can” log that helps students plot their own progress. Research has confirmed that when teachers use formative assessment, students can learn in six to seven months what would normally take a school year to learn. You’ll find yourself using this book every day because of the gains your students will achieve in foreign language fluency. These speaking assessment energize the class as the students have the opportunity to use a language function for a full minute. The students use language instead of practicing it.